10 symptoms of gastric ulcers in horses you need to be aware of! We get emails from horse owners every single day. Many of them are desperate because they have no clue why their horse is suffering: “My mare is grinding her teeth. ", “My gelding only needs to see a saddle girth, and starts kicking his stomach” or “My horse doesn’t eat well and he’s often colicky.” It’s often the case that the vet eventually finds out that stomach ulcers are causing all the trouble. Apparently, the problem is that the symptoms often aren’t interpreted correctly. Imagine your horse starts grinding his teeth. You are pretty sure he hasn’t done it before, but you don’t think of stomach ulcers immediately. This new behavior could be caused by something entirely different. You might ask yourself if the training puts too much stress on your horse, or if there is something wrong with his teeth. Or maybe you hope that it’s just a phase that will pass, soon. But then, your horse leaves more food untouched, every day. Of course, the reason for this could also be a high level of tension or dental problems. Or he just doesn’t like the feed. Some horses show even more symptoms, and others only show one of the typical warning signs, not all of these being as alarming as frequent colic. So it happens, that many stomach ulcers are recognized when it’s far too late. Here is a list of the most important symptoms. If you observe one or several of them (and if they don’t disappear in 4 weeks or less), you should talk to a vet. Alix Szepesi, an American horse trainer and dressage rider, also had to learn that some horses develop stomach ulcers even with perfectly horse-appropriate keeping. Before she could find out, what was wrong with her horse, she tried a whole bunch of things. Now she prevents ulcers with our natural feeding supplement Equine 74 Gastric. Read on to hear her tell the story of how she fought fiercely for her horses’ health. For American dressage trainer and rider Alix Szepesi feeding Equine 74 Gastric has been an eye-opening experience from which all her horses have reaped the benefits. 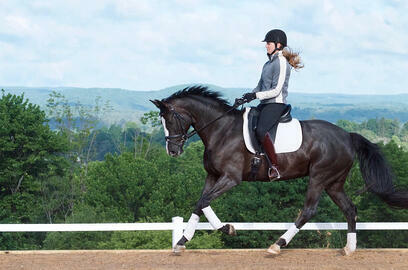 Szepesi has seen dramatic changes in her horses, not only in their performance level but also in their disposition. Based in Litchfield (CT) and in Wellington (FL) Szepesi is an FEI Dressage trainer who mainly competes at the Global Dressage Festival over the winter and at Saugerties and local shows in New England during the summer. Her top horse Douceur is a 10-year old Oldenburg gelding (by Don Primero x Royal Dance), owned by Michele Sweeny, while her rising stars are Skyline Sport Horses' 7-year U.S. bred Reine des Reves WS (by Starlight x Rosier) and her own 6-year old Oldenburg gelding Sir Sebastian (by Sir Gregory x Rubinstein I). Szepesi is an avid believer in good horsemanship and likes to keep her horses in the most natural environment possible while combining it with the standards of the high-performance sport. Despite Alix' dedicated efforts to give her horses a natural lifestyle in an environment as close to what mother nature intended, one of her horses struggled with gastric ulcers. Finding relief took her on a roller coaster ride in the equine pharmaceutical world that only drained wallets instead of finding solutions. Alix read Tinne Vilhelmson-Silfven's testimonial on Equine 74 Gastric on Eurodressage.com last year, she decided to give it a try despite reservations. "I was quite skeptical about Equine 74 Gastric at first, but thought if Tinne Vilhelmson thought it was good enough for her horses we’d give it a go. Seb’s symptoms when not being treated with Gastrogard and Misoprostol were a tight body, he was unfocused and spooky, behind the leg, kicking at my leg, lethargic, random fevers, hard to put weight on (tucked up belly), inconsistent manure, and he had minor colics. All of this made it hard to have a consistent training schedule let alone plan any showing which was really frustrating. I’ve never dealt with a horse with stomach problems before and was at my wits end," Szepesi admitted. 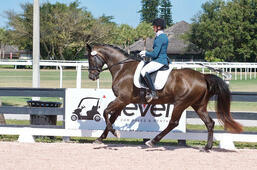 "When I had first enquired about Equine 74 Gastric it was not yet available here in the United States. Coincidentally, about a month after the 3rd treatment of Gastrogard and Misoprostol when Seb was starting to show signs of discomfort again, the product started being sold here in the U.S. by Anita Van Slyke. I got the trial size and after about two weeks I started to notice the signs of discomfort going away. He wasn’t so distracted, was much looser in the body and accepting of my leg when riding, lost the tucked up look to his belly, was starting to put some weight on and had consistent manure. It’s been a year now since we’ve been using Equine 74 Gastric and Seb has shown none of the signs of discomfort he consistently had before we started using it. Prevention is way better than having to cure gastric ulcers!" Szepesi is now a firm believer in the benefits of Equine 74 Gastric. When she saw the positive effects of Equine 74 Gastric on Sir Sebastian, she decided to try it on all the other horses even though none of them were showing signs of gastric discomfort. Szepesi now suggests Equine 74 Gastric to all her clients and friends as she has seen the positive difference in nine horses out of nine so far. "To me it’s a no brainer as all horses are happier on it plus it makes my job much easier because the horses that, for no medical/lameness reasons we could find, had issues with being behind the leg, distracted, spooky, or tight in the body all became easier to progress in their training," she said.